Great style does not require an over-the-top budget. Whether your style is modern, eclectic, country, coastal, or wild and funky, with a little creativity, basic skills, few craft supplies, home improvement products and a few bargain finds, you can achieve a unique custom look, finding creative ways to make the most out of ordinary pieces to express your personal decorating style. Decorate walls and floors with unique paint finishes, textured wallpaper, murals, decorative stenciling, stamping. Use left over paints and create your own colors. If there's not enough paint for the entire room, then make the wall behind the bed a stand out feature wall and bring unity to the bedroom color scheme with painted picture frames, shelves, side tables or cupboards in the same color. Add interest to your furnishings and dress up furniture and lampshades - decoupage, stain, stamp or stencil using fun patterns and motifs, accent with glitter, faux crystals, beads, silk flowers. Dress the furniture up further with novelty drawer pulls. For dazzling decorating - fabric can play a starring role in every room in the home. Different fabric styles and textures can add immediate comfort and warmth to a pillow, cheer to a plain window, or drama to a tailored lampshade. Whatever your decor style may be, create beautiful pillows for beds, chairs, and sofas with stunning fabrics and add fun borders and edgings, trimmings, fastenings, and surface decoration. Clever ideas: Before discarding old clothes or bedding, take off any buttons and trimmings - and you can reuse them for your home decorating projects. Freshening up the bed and bath is a breeze with color. Plain bed linen can be jazzed up with craft paints, basic embroidery or applique designs. Cushions piled on a bed make even the coolest room feel more cosy and inviting. Dress up basic style cushion covers with buttons, sheer silk scarf tie fastenings and other decorations. Slipcover your headboard. Drape the bed with a canopy, glue sequins, diamontes, ribbons. Turn a plain window into a work of art. Curtains and shades are a necessary part of every home decor. Explore different ways of dressing your windows using fabrics, screens, shutters, bead curtain using ribbons, shells; a window panel personalized with applique shapes; a stylish no-sew curtain made from a bed sheet, decorate the frame, sill, or even the windowpane. 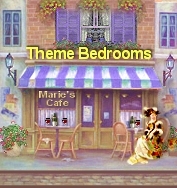 Paint the shades to suit your room style, color or theme. Embellish the bottom of your shade with flat trimmings. These are just a few of the ways you can alter or enhance the look and mood of any window in any room in your home. Have fun with lighting, paint your own design on paper lanterns, string your Christmas fairy lights around headboards, mirrors or windows for all year sparkle. Add some life to plain lamp shades and dress up the edges with decorative fringe, which can be attached with heat resistant glue, other ideas and options - use feathers, ribbons, pom poms, sequins or crystals. Flickering candlelight is ultra soothing and candlesticks with scented candles will create a soft, romantic mood in the bedroom or bathroom. Use fresh accents. A bowl of oranges on the table adds a jolt of warm color. Breathe life into a room with fresh flowers, pinecones, marble balls, glass orbs. These decorative touches can add pleasing color and texture to the room. Create a cozy window seat reading nook. Place bookshelves on either side of the window and a storage seat or bed inbetween the bookshelves. Also a simple bookcase with fresh detailing stands out as smart storage for a dining room. Use left over wallpaper to line shelves and drawers. Decorate storage boxes. Or make your own cutouts. Disguise inexpensive adjustable shelving by adding wood trim around the edges and painting everything, including the metal standards and braces, to match the wall color. Trunks are a great storage option, and can double as a table and also provide storage for bed linens and out-of-season clothes. Salvaged items can be used in elegant rooms to funky apartments. Architectural salvage is all about saving and reusing unique bits and pieces - whether from old buildings, businesses, local flea markets, neighborhood garage sales or vintage furniture stores. With a little loving care and a touch of elbow grease you can transform the most forlorn-looking pieces into charming additions for all rooms of the home. Good old antiques - such as a solid-oak door, an Arts & Crafts fireplace mantel, a Victorian stained-glass window or an Art Deco lamp can add a little Vintage comfort. Transform a panel from an old upright piano into a headboard for your bed, creative mosaic table made from broken bits of old china or tiles, antique faucet handles into towel holders, Antique doorknobs become curtain tie-backs. - smart, chic, sensible, stylish ideas from flea market finds - can impart character and heritage to any home of your dreams. get creative ... and think outside the square. Special Interests - Videos Home & Garden Crafts & Hobbies, Faux Painting, Stenciling, Decoupage and more..
Burke Decor - unique home furnishings, gifts and home improvement products. Modern designer products - wallpaper, custom-made pillows, reproduction planters. Pacific Pillows bedding trusted by world class hotels and resorts! And your big day is fast approaching ... it’s time to make the dream a reality and get the wedding reception decorations looking magical! In a forest. On a farm. In a vineyard - where family, friends and the beauty of nature are gathered -!